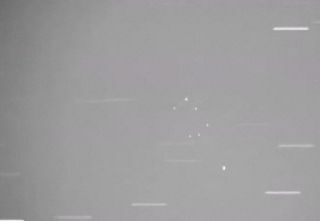 This image is a still from a short video produced by Greg Roberts of the U.S. secret satellite DSP-F23 (bright dot at bottom) as it approached the ASTRA 1 constellation group. This story was updated at 5:17 p.m. EST. While theunprecedented smashup between a U.S. and Russian satellite earlier this monthsparked a lot of attention, another wayward spacecraft — out-of-whack U.S.secret satellite DSP-23 — remains a serious concern. Lofted intoorbit in November 2007, this Defense Support Program (DSP) spacecraft apparentlywent belly-up the following year. Making matters worse, DSP-23 died beforeit could be nudged into a graveyard orbit, where it would no longer be a collision threat for other satellites. Thesatellite is one of a constellation of Earth-staring spacecraft designed tospot orbits rocket launches, nuclear blasts, as well as gather other types oftechnical intelligence from their 22,300-mile (35,888-km) geosynchronous (GEO). Last month,space reporter Craig Covault at Spaceflight Now broke the story that twoMicro-Satellite Technology Experiment (MiTEx) satellites were dispatched topeek in on the errant satellite. Of course, mum?s the word from the U.S.military on the DSP-23?s off-kilter status. But,fingers are crossed at SES ASTRA — operator of the ASTRA Satellite System thatprovides satellite services in Europe — regarding the meanderings of DSP-23. Themisbehaving DSP-23 spacecraft has?visited? ASTRA satellites for the last two months. That SES ASTRA systemis used by a wide range of broadcast and multimedia companies to deliverrevenue generating broadcast and broadband services to 117 million households. ?It will beof concern for many other positions?for a very long time,? said Hugues Larocheof SES Engineering. ?As operators of GEO satellites I guess we are stillexposed to lowerrisks of collision probabilities than low Earth orbits, but still this is aconcern,? he told SPACE.com. That?sespecially the case, Laroche added, since the GEO ring is such a tiny resource.When a satellite dies prematurely there, it remains in the vicinity for a longtime?with a longitude swing on one hand and an inclination drift on the other,he said. Larochesaid it?s time for the actors in the satellite field ?to stop acting each oneon their side.? Rather, there?s need to increase coordination, he concluded. Meanwhile,a loosely knit — but high-tech — group of amateursatellite detectives has been keeping tabs on the orbital wandering ofDSP-23. For example, skywatcher Ted Molczan of Toronto, Canada, has used a computerprogram developed by fellow hobbyist Mike McCants to predict DSP-23's orbitthrough 2051, to chart the spacecraft's drift — a plot that tracks the satellite's oscillation between longitude extremes over a long period of time. ?Currently,DSP-23?s orbit is inclined about 2.8 degrees, which is slowly decreasing, suchthat by 2012, it will be inclined just 0.3 deg, whereupon it will begin toincrease,? Molczan told SPACE.com. ?By 2015, it will have returned toits present inclination.? Since many,if not most, operational GEO satellites have similarly small inclinations, thismeans that DSP-23 will remain in their immediate vicinity for at least the nextsix years, Molczan said. By about 2036, the spysat?s inclination will rise toabout 15 degrees, which will reduce the time it spends in close proximity tooperational GEO satellites, he added. ?Butdecades later, its inclination will return to its present small value,increasing the hazard it poses to operational satellites of that time. Thislong-term oscillation in inclination will continue for a very long time,?Molczan said. Molczanspotlights the efforts of his satellite watching colleagues, Greg Roberts ofSouth Africa and Peter Wakelin of the U.K., since they performed a load of hardwork to track DSP-23 during its time in the eastern hemisphere. Robertsused a collection of sophisticated gear to observe DSP-23, though his sightingssuggest that nothing too dramatic is happening to the satellite. ?It has speededup its eastward drift... but that?s because of natural causes as I don?t thinkthe satellite is under any form of human control,? Roberts told SPACE.com. The twoMiTEx micro-satellites inspectors, Roberts added, are both drifting eastwardand are now too low in his eastern sky to track optically. ?I haven?theard anything about the results of their inspections in late December 2008 andearly January 2009,? Roberts said. ?Since then, the two MiTEx satellites havenot changed their orbits so either the operators are happy to leave them intheir current drifting orbits or the satellites are no longer operable —probably the former. ?Of courseDSP-23 continues on its course and passing close to operational craft quitefrequently?from what I have heard, the closest approach so far has been justunder 12 kilometers (7.5 miles),? Roberts said. Other thantracking DSP-23 as a matter of course, Roberts pointed out that the amateurnetwork is not keeping a look-out for ?close encounters? with other spacecraft. Half ofthese occur in the daylight hours in this part of the world so could not beseen even if there was a possible chance of collision, he said. ?I don?tknow if the U.S. Department of Defense is alerting commercial operators of thepossible need to move craft,? Roberts said. But hewould imagine such groups as the International Scientific Optical Network(ISON), a far flung group of scientific optical facilities for observation ofhigh altitude geocentric orbit, is busy keeping an eye on all the celestialaction. Network data collecting and crunching is done at the Keldysh Instituteof Applied Mathematics of the Russian Academy of Sciences.